This How-To is written to get you quickly receiving satellite data with an Omnidirectional antenna (an antenna that does not move). I'm assuming that you are a bit familiar with amateur radio, or linux in general, or you already have a Raspberry Pi. First off, I'd like to set some expectations around a SatNOGs station with an omnidirectional antenna. Yes, you will be able to hear satellites, Morse code beacons, maybe even some voice contacts on a FM transponder. But for CubeSats with 1 watt transmitters at 9600 baud, it's going to be really difficult to actually decode any data with an omni antenna. You'll definitely see squiggly lines on the waterfall plot, but demodulating the signal and extracting satellite telemetry is going to be pretty difficult. The only way to get more signal is a better antenna. And a better antenna with more gain is going to be more directional, which means you will need a way to point that antenna at the satellite, and this How-To just got a lot more complicated. So we're not going there. A better preamp helps a bit, see the LNA section below. I chose the Raspberry Pi 3 Model B for my station. The SatNOGs team has done a great job creating a Raspbian image with all the required software. Simply navigate over to the latest tag on Gitlab, and click on the "Zipped image" link under the latest tag. It's about 650 MBytes. Thinking I could save a few bucks, I used a no-name generic 2.4 amp "tablet" USB power supply I got as a freebie, and a micro-USB cable I use for charging my phone. What a mistake! The Micro-USB cable wire gauge was too small, so there was too much voltage drop on the cable, so the Raspberry Pi reported power problems every time it was doing anything. Power problems are indicated by either a lightning bolt in the upper right of the monitor, or the red power LED flashes on the board itself. If The Raspberry Pi processor itself is pretty forgiving of power droops because it runs at 3.3 volts. But the 5v USB ports are directly tied to input power, so undervoltage conditions will cause problems for USB devices, such as the RTL SDR dongle. Required: Network: for registering your station and adding data to the network. Recommended: Forums: for asking questions. Optional: Database: Only if you want to add satellites/modes. Not necessary for receiving satellite data. Log in to your Network account, and click the "+ Add Ground Station" button, or click here Fill out the short form, and your station will be added to the database. For "Antenna", pick something that encompasses the frequency range of your antenna. For wideband reception, use VHF Discone 26-1200 MHz. The important info you'll need later on is the Station ID number, lat/lon/altitiude. I would also use a Minimum Horizon of 30 degrees or so, this will keep your station from allowing low-elevation passes to be scheduled. Make sure to keep the "Testing" flag checked, as this lets people know that your station isn't quite ready for real use. After you have the image burned onto a Micro-SD card, boot it! I would recommend hooking up a keyboard and HDMI monitor, you can watch the boot process. If it doesn't boot at all, double check that you wrote the SatNOGs Raspbian image correctly. Run sudo raspi-config to set up the base OS. Tab switches between the options and select. This will expand the ~2GB Micro-SD card partition to fill the entire SD card. Then reboot again. To make sure that it worked, run ifconfig and make sure that wlan0 isn't listed. I'm not sure how to tell if bluetooth is turned off. bmon - a graphical network usage analyzer. Once you have the base Raspbian Strech OS installed, updated, and looking good, you can configure SatNOGs. Plug in your RTL SDR if you haven't already. First thing to do is update the satnogs-setup program. Run sudo satnogs-setup. This will probably take a while, then Update, which will also take a while. Per usual, after the update I like to reboot the raspberry pi just to make sure everything was updated and is actually running the new code. SATNOGS_API_TOKEN: After logging in to network.satnogs.org, this is in the upper right under "API Key"
SATNOGS_STATION_ID: The number of your station. Newer stations are high 200s. Then back to the main menu and Apply to save the configuration. Ansible will run, change some stuff, and probably take a while. If you want to quit, just keep pressing back to exit. samples get lost. If you observe no further output, everything is fine. Since I have a LNA with a gain of slightly under 20dB, I picked 8.7dB of gain for the RTL SDR. This value goes into the SATNOGS_RF_GAIN setting under Advanced settings in satnogs-setup. Basic hardware configuration is Antenna > Short coax > LNA > Coax > RTL SDR. The way to measure the performance of an antenna is using a figure of merit called the Antenna gain-to-noise-temperature (G/T). It's a positive unitless number, higher the better. Increasing the antenna gain is difficult, only because we decided on an omnidirectional antenna as the basis for this How-To. Omnidirectional antennas top out at maybe 7 dB gain or so, and that's just from pushing the radiation pattern up to the sky away from the ground. Any more gain than that and it's not an omni antenna; it's got a direction that the antenna needs to be pointed in. And we want to stay away from pointing antennas for now. For testing on the bench, pretty much any antenna will do. 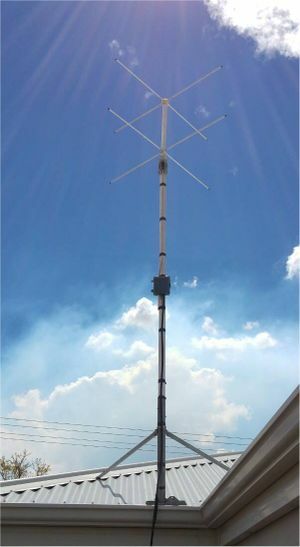 Or if you have a whip antenna already outside for repeater work, use that. As I mentioned before, I've successfully used a mag-mount antenna stuck to a cookie sheet, sitting inside my living room window. Also, remember that some new low emissivity double-pane windows use metal films to keep heat inside. Unfortunately, this also attenuates pretty much all RF signals, see this article for more background. Now that you have the hardware and software up and running, go ahead and schedule some passes. Navigate to your station page, and click on the Schedule button on the right side of some promising passes. The green and red bars beneath the satellite name is a quick visual indication of the number of Good and Bad passes on the network. Unfortunately, this data is not time-stamped at all, so a satellite that had a lot of Good observations a long time ago, but recently died, would still show as Green. Good if the satellite is seen in the waterfall at all. The satellite will be a straight line in the middle of the waterfall plot. Bad if the satellite is not seen. Failed if there was a problem with the station, such as a mis-configuration, or if the waterfall is missing or a solid color. This is not super important for a new station. Now that you've got this station working on the bench, what's next? IQ3KU Omnidirectional station build write-up. This page was last edited on 13 April 2019, at 13:44.